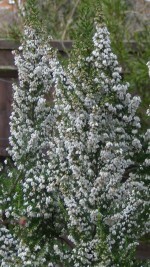 Upright shrub to 1.5m or more tall; branches ascending. Leaves to 6mm long. Flowers in terminal umbels of 2–4; calyx composed of 4 free pink or green sepals; corolla white changing to pink (H8/H11), about 5mm long, urn-shaped; stamens 8, included; anthers with spurs; style-end emergent. Blooms irregularly through the year, mainly in spring and early summer. 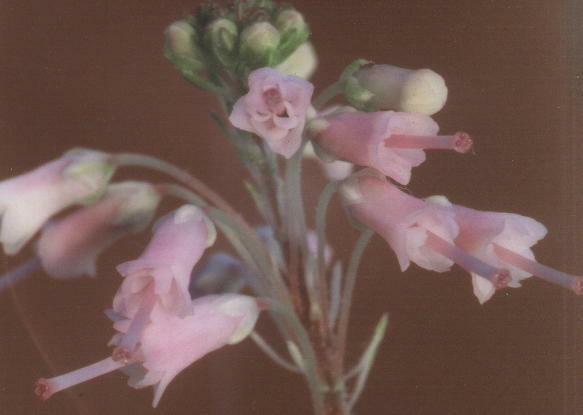 An artificial hybrid, created deliberately in the 1980s by Kurt Kramer (Edewecht, Germany) by cross-pollinating Erica arborea 'Alpina' and Erica baccans. Only the original (unnamed) clone is understood to be in cultivation but it is not commercially available. Erect, twiggy shrub to 2m tall. Leaves in whorls of 4, to 7.5mm long, dark green. Flowers in terminal clusters of about 10–12; calyx of 4 free sepals; corolla dark pink (rarely white), tubular-urn-shaped to 7mm long; stamens 8, included; anthers with slender spurs; style-end emergent. Blooms mid- to late-summer and early autumn. 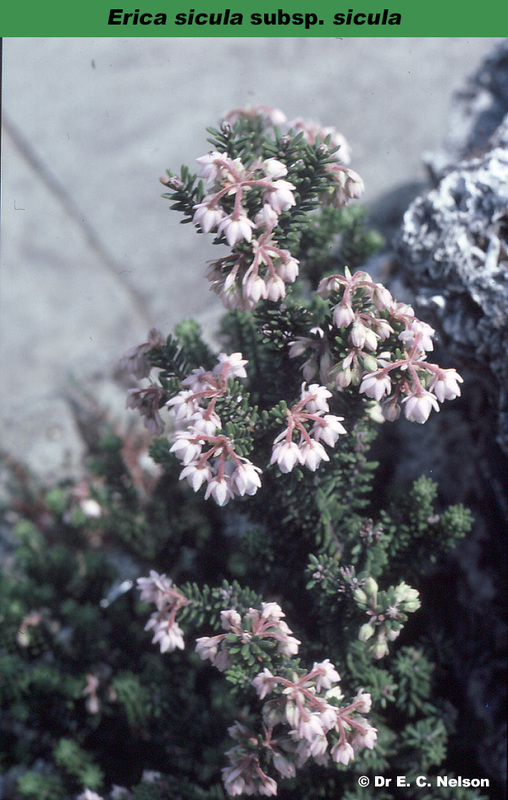 Related to Mackay's heath (Erica mackayana) and cross-leaved heath (Erica tetralix). Restricted to south-western Spain (Huelva) and adjacent areas of south-eastern Portugal. A remarkable plant that can tolerate very high levels of toxic chemicals in the soil, as well as inundation during winter. It colonizes abandoned mines and adjacent river valleys which are often seriously polluted. 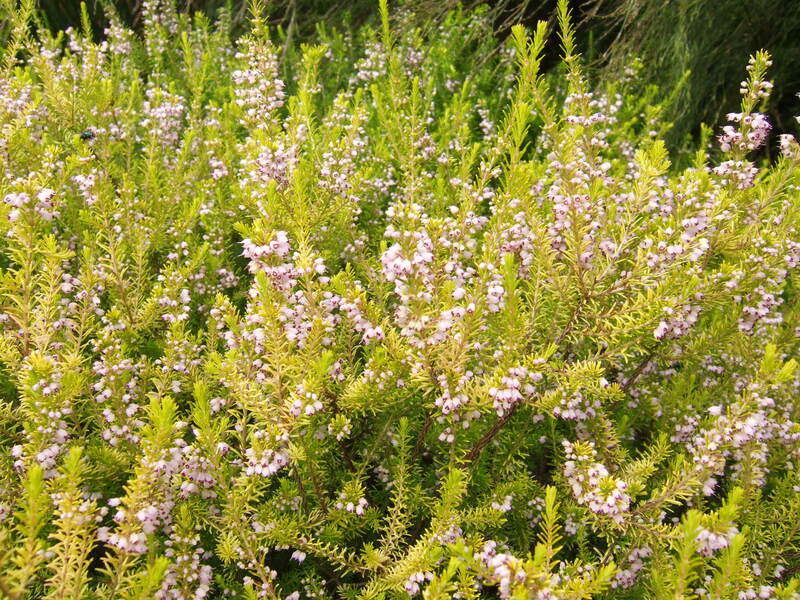 Introduced into cultivation in 1982 by David Small (Denbeigh Heather Nurseries, Creeting St Mary), David McClintock and Dr Charles Nelson (National Botanic Gardens, Glasnevin, Dublin). 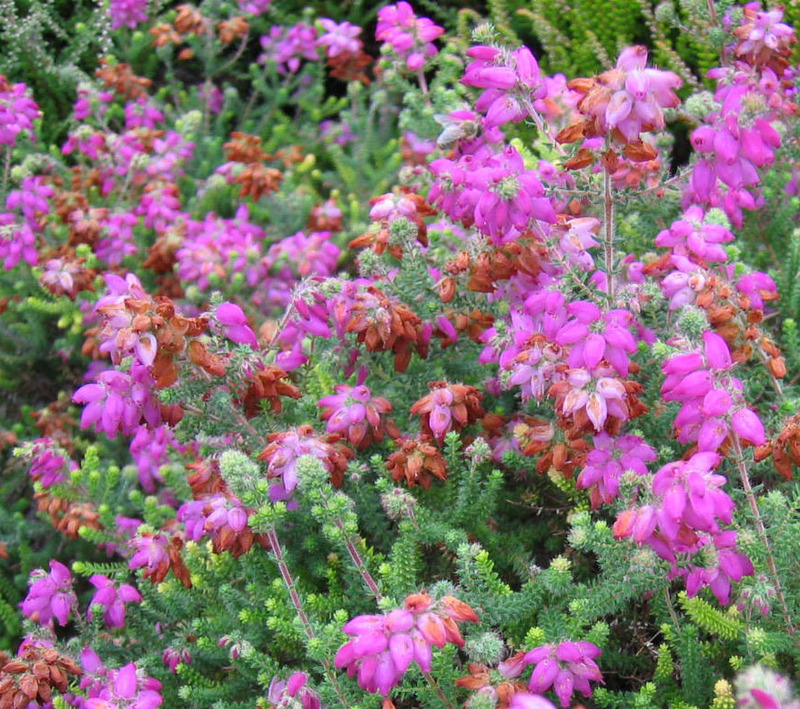 An artificially created hybrid raised by cross-pollination of the southern Iberian endemic Erica andevalensis and the cross-leaved heath, Erica tetralix. Their natural ranges do not overlap. Only one clone is known to have been introduced into cultivation. 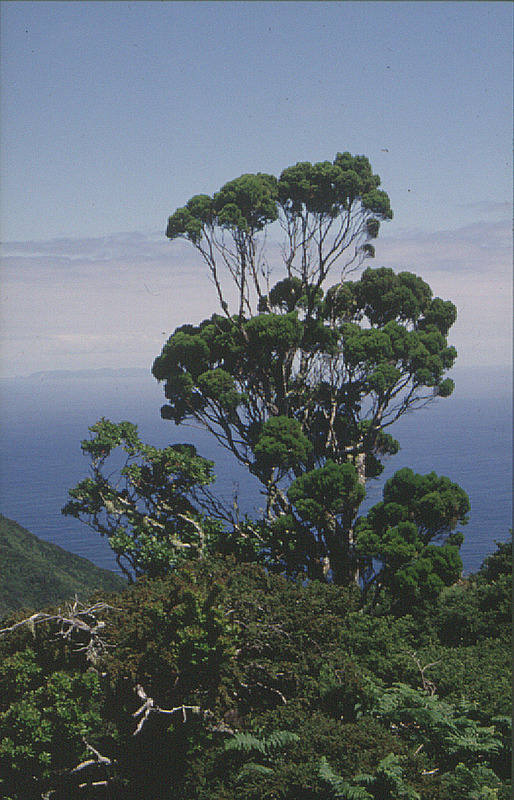 Tree to 15m (or more) tall, or bushy shrub with a lignotuber. Leaves in whorls of 3, to 7mm long. Flowers in umbels of 2–4 on short leafy shoots; honey scented; calyx cup-shaped, 4-lobed, white; corolla white, bell-shaped, ±3mm long; stamens 8 visible at mouth of corolla; anthers with spurs; style-end emergent. Blooms in winter and spring. One of the most wide-ranging heathers, from the Canary Islands and Madeira, through the Mediterranean basin and north Africa to the eastern Black Sea, Yemen and Saudi Arabia, central Sahara, Ethiopia and into east Africa. Plants in cultivation are probably of Mediterranean origin. It varies in hardiness from frost-tender to suitable for hardiness zone 7, and is not as tolerant of lime as commonly supposed. Young plants should be shaped in the early years to avoid untidy growth. Tree heath can be damaged by heavy snowfalls but will break from the base again. Shrub to 1.5m or more tall. Leaves in whorls of 4, to 7mm long. Flowers terminal on leafy lateral shoot in fours, buds resin-coated and very sticky; calyx with 4 unequal, free sepals, green or reddish; corolla pink (rarely white) tubular-campanulate, to 8mm long; stamens 8, included; anthers with spurs; style-end exserted; nectar copious. Blooms in winter to late spring or early summer. Confined to Spain, Portugal and northern Morocco. It requires acid soil conditions and although suitable for zone 8 is prone to damage by wind or snow. Shrub or tree to 10m tall. Leaves to 3.5mm long with pair of furrows underneath; flowers tiny in umbels of 1–3 flowers, crowded on shoots; calyx green, 4-lobed, closely appressed to corolla; corolla pale to dark chestnut-brown with white lobes or greenish with pink tinge, bell-shaped, less than 3mm long; stamens 8, included; anthers without spurs, brown, shedding clouds of pollen; style very short; style-end enlarged, 2.5mm diameter, conical (so that style and stigma together are mushroom-like), deep red-purple; nectar not produced. Azores only; on all islands, reaching around 1,500m altitude. 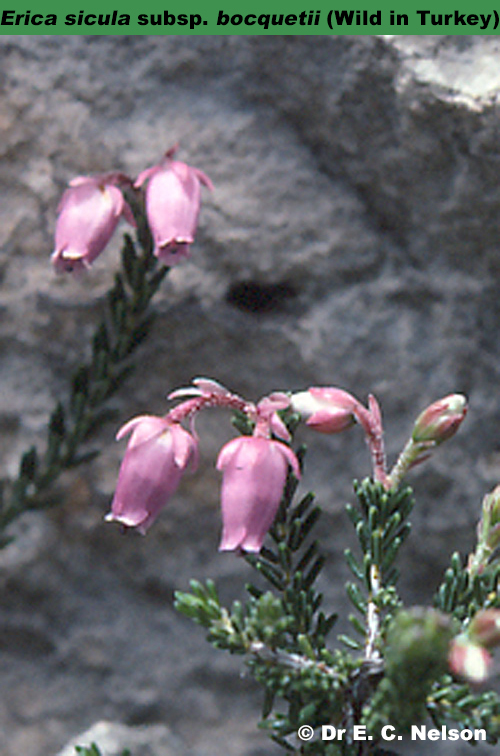 Related to the besom heaths of Maderia and the Canary Islands (Erica platycodon), and mainland Europe (Erica scoparia). It has been cultivated in Britain and Ireland since the early twentieth century, but it not especially ornamental although the chestnut-coloured flowers and spiralling foliage are attractive. Suitable for zone 6. Low shrub to 0.3m tall, branches creeping, often rooting. Leaves in whorls of 4, to 8mm long. Flowers 2–3 in axillary clusters on short side-shoots; calyx 4-lobed, waxy, thicker in texture than corolla, coloured (usually similar to that of corolla); corolla lavender-mauve to pink, often becoming darker with age, or white, to 9mm long, ovoid-tubular; stamens 8, emergent; anthers without spurs; style-end not enlarged; nectar profuse. Blooms in late winter and spring. Low-growing heath from the alpine regions of Europe. 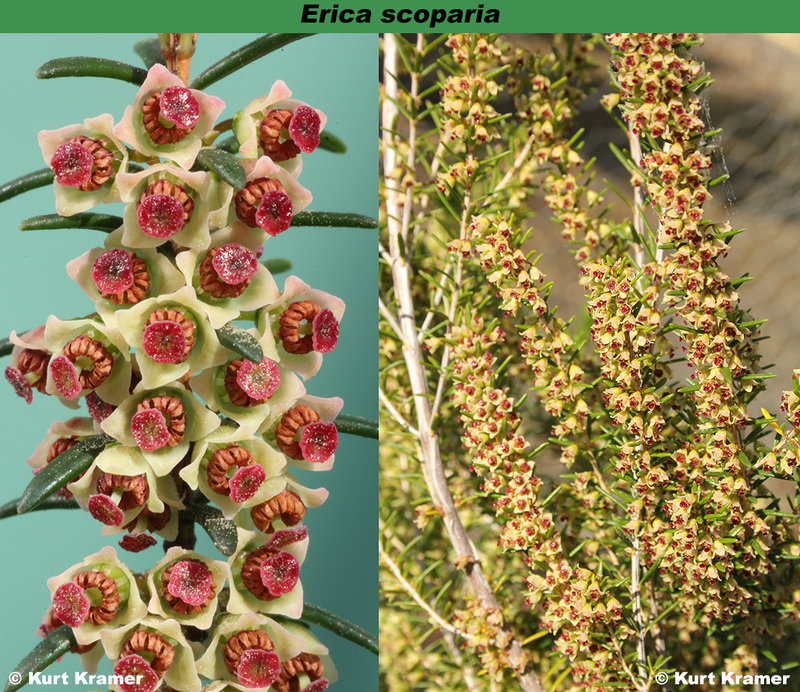 The flowering times of cultivars of Erica carnea vary markedly, plants in milder climates being as much as two months earlier than those in colder conditions. Generally, they can be expected to show flower for 6-8 weeks. Winter heath tolerates lime and a little shade and, with a few exceptions, rarely requires pruning. 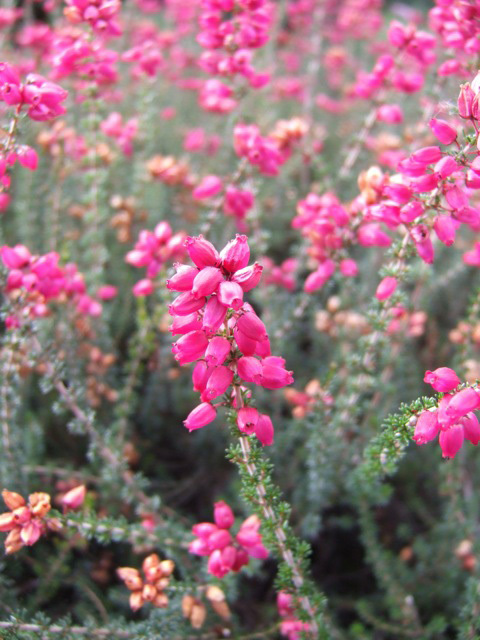 It is one of the hardiest of all heaths, suitable for hardiness zone 4. Care must be taken when pruning Erica carnea because buds for the next year's flowers form as early as July. It is safest to prune immediately after the flowers have faded. Prune around the edges and very lightly over the top of the plant. 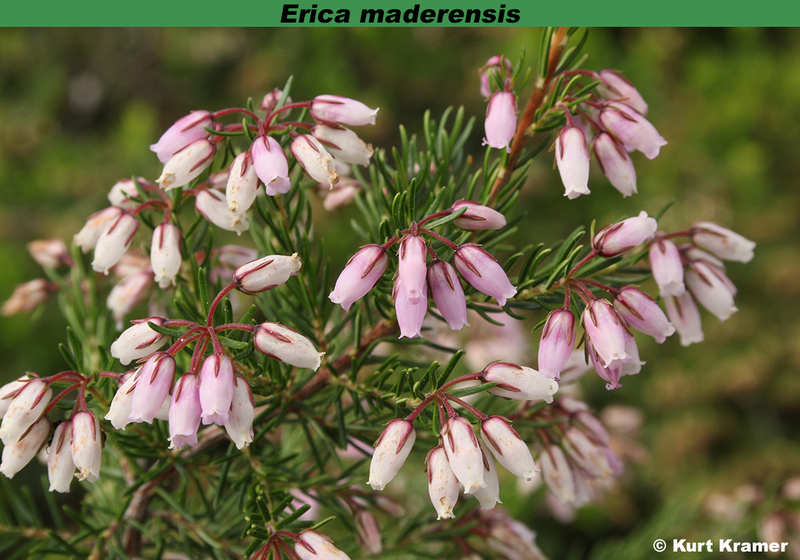 Closely related to Irish heath (Erica erigena). Low, diffuse much-branched shrub to 0.5m (rarely to 2m) tall. Leaves in whorls of 3, to 5mm long, oval, flat. Flowers in a terminal, more or less unilateral, elongated, erect spike; calyx of 4 free, green sepals; corolla pink (rarely white), ovoid but lop-sided, about 11mm long, mouth asymmetrical; stamens 8, included; anthers without awns; style emergent; nectar produced. Blooms in summer and autumn. Native to south-western England, north-western France, northern Spain, western Portugal and northern Morocco. There is a small colony in Connemara, western Ireland, which may not be indigenous. 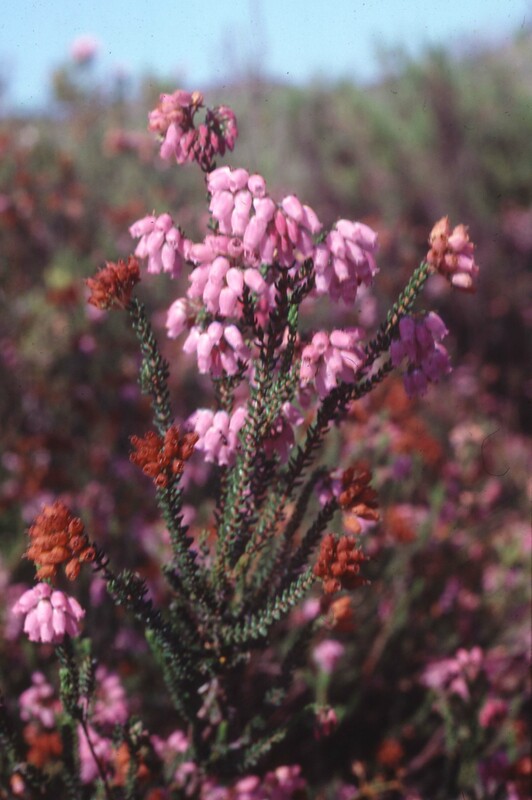 Dorsert heath has long spikes of flowers from mid-summer to mid-autumn. It prefers moist, acid, sunny positions and is suitable for hardiness zone 7 with protection. Bushy shrub to 0.8m tall, with numerous non-flowering lateral shoots. Leaves in whorls of 3 (or spirally arranged), usually shorter than 5mm. Flowers 1–5 in a whorl on each lateral shoot; ; calyx with 4 unequal lanceolate to triangular sepals, mostly green; corolla usually rich purple (sometimes paler or white), to 7mm long, ovoid-urceolate; stamens 8, included; anthers with crest-like spurs; style-end emergent, nectar produced. Blooming in summer and early autumn. Ranging from western Norway and the Faeroe Islands through Ireland, Britain, north-western Germany, Netherlands, Belgium, France, north-western Italy, Spain and Portugal, and with an isolated colony in Algeria. 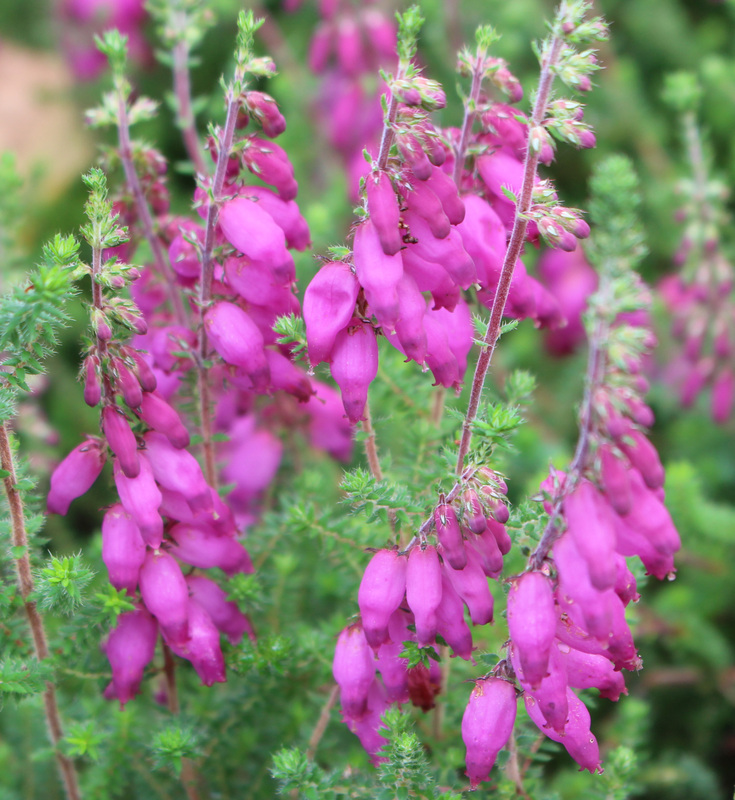 Bell heather requires an acid soil, an open sunny position and is suitable for hardiness zone 7 provided some protection is given. Shrub to 1m tall, branches ascending. Leaves like Erica carnea. Flowers pink to mauve, or white, ; calyx cup-like, 4-lobed, waxy, thicker in texture than corolla, lusually coloured like the corolla; corolla to 5.5mm long, ovoid; stamens 8, partly emergent; anthers without awns. 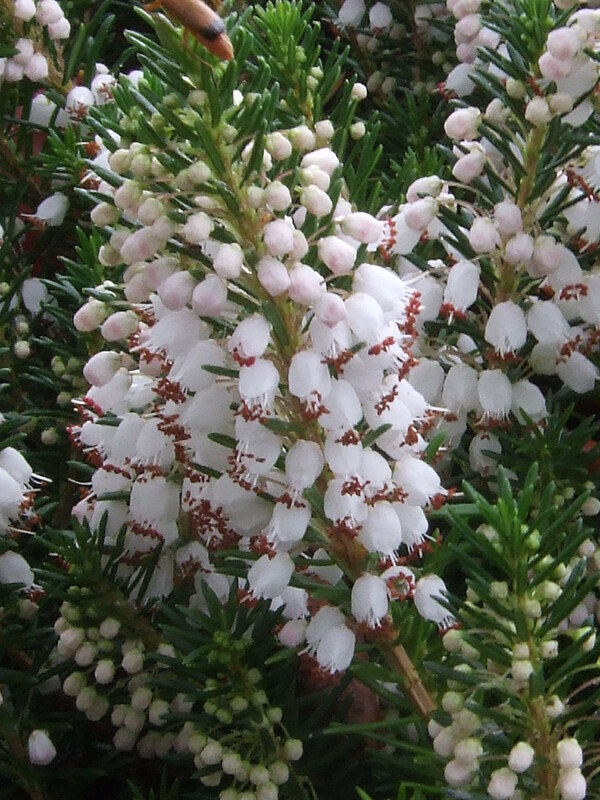 A hybrid between winter heath (Erica carnea) and Irish heath (Erica erigena); the original was found in a nursery in Darley Dale, Derbyshire, in the late nineteenth century. Numerous seedlings have been raised in recent years in deliberate breedings programmes. Fully hardy, and one of the easiest heathers to grow, being suitable for all soils and is particularly good at smothering weeds. The cultivars have a long flowering period and often exhibit coloured young shoots. It is hardy to zone 7. Bushy shrub to 3m tall; leaves in whorls of 4; flowers axillary, in clusters of 2–5, honey scented; calyx cup-shaped with 4 lobes, waxy, thicker in texture than corolla, and usually the same colour or paler; corolla in various shades of mauve to pale lavender, very rarely white, to 5mm long, ovate-urceolate; stamens 8, anthers partly emergent, without awns; nectar produced. Blooming in late winter and spring (but can start in early winter). Native in scattered localities in south-western France, Spain and Portugal. In western Ireland it may be an ancient introduction. 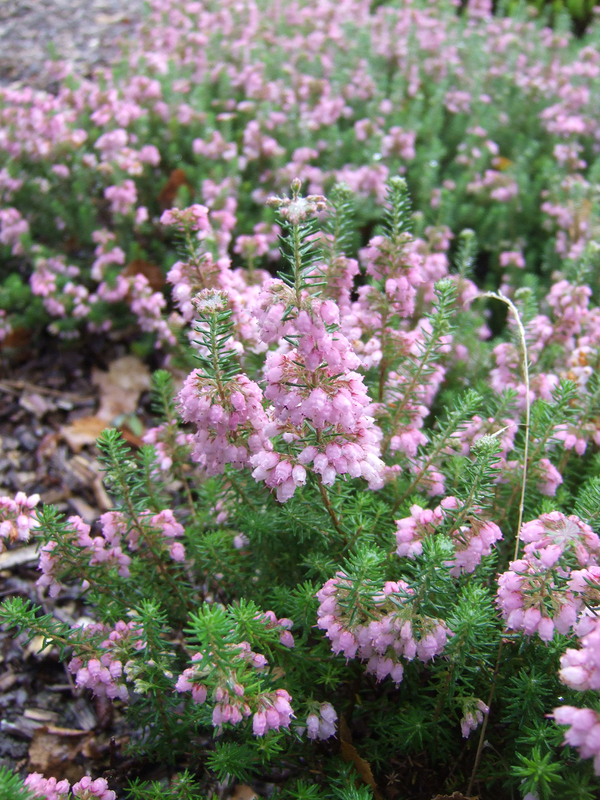 Irish heath can be grown in most soils and is ideal for low hedging and to form formal 'architectural' features. Suitable for hardiness zone 7, it can be grown with protection in zone 4, where some damage can occur especially from heavy snow. 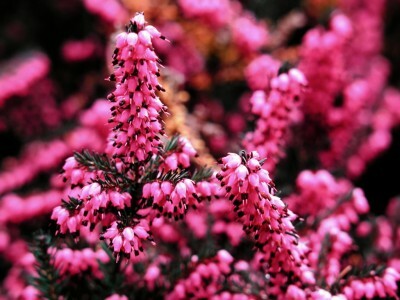 Closely related to winter heath (Erica carnea). Hardy, evergreen shrub with leaves in 3s. Inflorescence comprising solitary flowers, or whorls of (2–)3 flowers, in terminal clusters on axillary shoots, crowded and appearing to form showy panicles. Flowers white or with very slight pink tinge in buds (due to red-brown anthers); calyx white, waxy, thicker in texture than corolla; corolla ovate-campanulate, about 6mm long. Stamens 8, included or partly emergent from mouth of corolla; anthers usually with 2 minute, vestigial spurs; stigma same width as style; nectary dark green. Blooms in winter, and at least 'Johannes van Leuven' has coloured shoot tips in spring. Shrub, variable in habit depending on parentage; leaves in whorls of 4, about 5mm long, elliptical to linear, densely pubescent on upper surface; flowers in umbels on lateral shoots or terminal;; calyx 4-lobed; corolla pink or white, to 5.5mm long, urceolate; stamens 8; anthers with spurs of different and varying lengths; nectar present. Blooms in summer and early autumn. 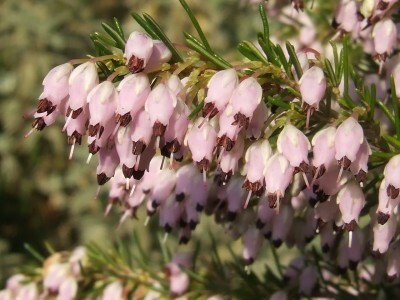 An artificial hybrid, first produced by Professor John Griffiths, from cross-leaved heath (Erica tetralix) and whorled heath (Erica manipuliflora). Shrub to 0.5m tall; shoots erect or spreading; leaves in whorls of 4, to 8mm long; 1–4 flowers in axillary umbels on short leafy shoots, scented; calyx 4-lobed, variously coloured green or pink; corolla pink, campanulate, to 3mm long; stamens 8, erect, fully emerged; anthers without spurs. 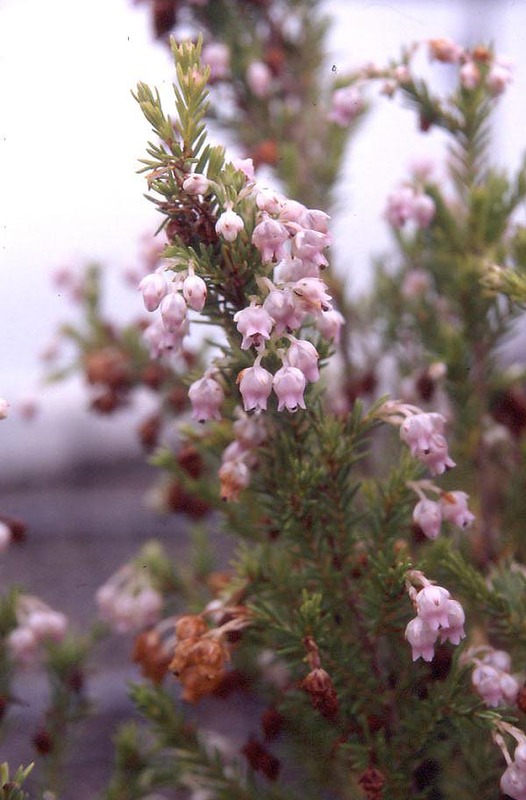 A hybrid between Erica manipuliflora (whorled heath) and Erica vagans (Cornish heath) which occurred by chance in Britain in the mid-twentieth century. 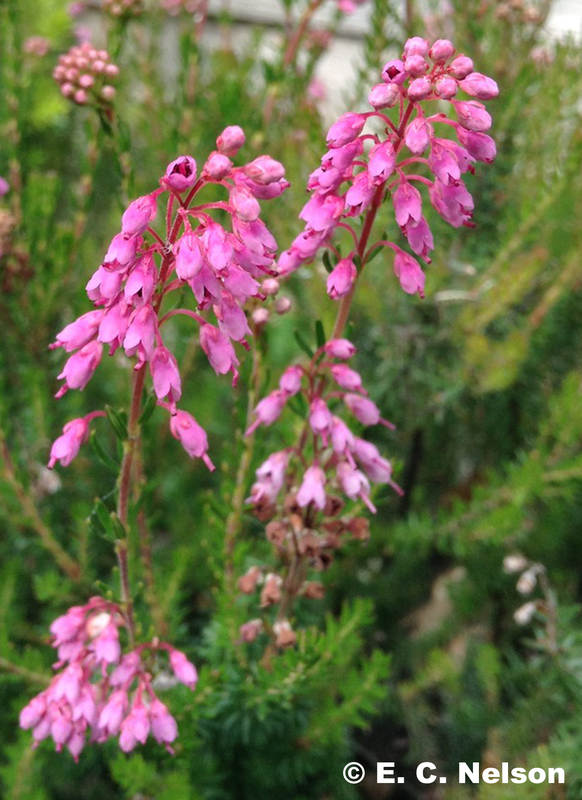 The clones are lime-tolerant, hardy (suitable for zone 6), and have the vigour of whorled heath and the compactness and early flowering of Cornish heath. Named after Professor John Griffiths, the first person to create the hybrid deliberately. Low shrub, 0.2–0.5m tall, spreading to about 0.5m across; shoots erect; new shoots discoloured (orange-red) in spring; leaves in whorls of 3 or 4, to 6mm long; flowers small, as many as 20 clustered in a compact (to 1cm long) terminal spike; calyx 4-lobed, colourless; corolla urn- to cup-shaped, about 4mm long, white to pink; stamens 8, not exserted; anthers without spurs; style (when not malformed) exserted. 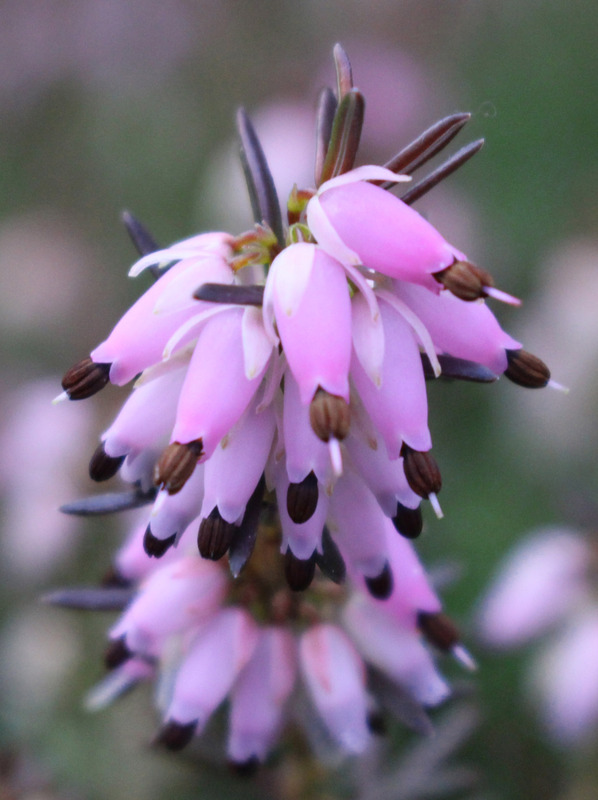 Deliberately created hybrid between Erica carnea (winter heath) and Erica spiculifolia (Balkan heath) which have a long flowering period with tiny flowers. Named after Kurt Kramer who was the first, and is the only, person to make the cross. 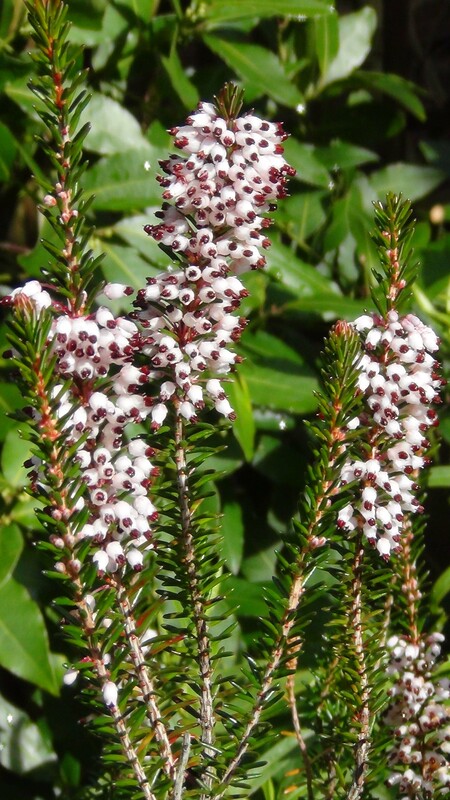 Kramer's heath requires an acid soil and is suitable for zones 5-9. 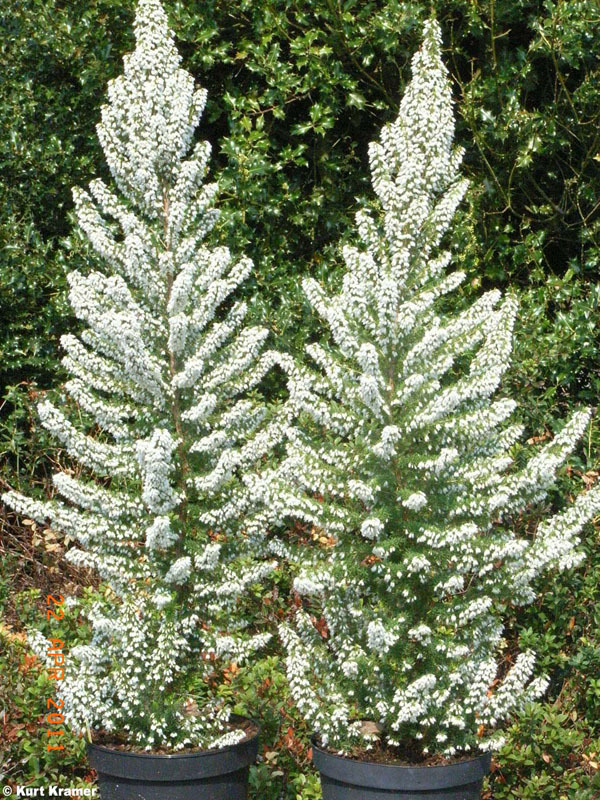 White flowers, XII–V, buts sometimes tinged pink; mid-green foliage; open erect habit; height to 1-4.5m; spread 61–75cm; leaves in whorls of 4 (sometimes in 3s), to 7mm long; flowers numerous and crowded appearing to form elongated spikes: 1–4 flowers in each terminal umbel at tip of short, leafy lateral shoots; calyx conical, with 4 lobes, white, waxy; corolla white, often tinged pink in bud, bell-shaped to tubular, to 5mm long; stamens 8, included; filaments white, with hairs on lower third; anthers with 2 spurs; style-end emergent, tinged red; nectar copious. Bushy shrub to 1.5m tall, branches ascending or sprawling; leaves in evenly spaced whorls of 4, always spreading more or less horizontally, obovate, flat; terminal umbels of about 10 flowers, evenly spaced, not lop-sided; flowers stalks not woolly; calyx of 4 unequal, free, green sepals, to 3.5mm long, not woolly on outside; corolla urn-shaped, to 7mm long, pale to dark pink, usually darker on sunlit side, or pure white; stamens 8, included; anthers with spurs; style-end emergent; nectar produced. Blooms in summer (and early autumn). Only found in western Ireland (counties Kerry, Galway, Mayo, Donegal) and northern Spain. Plants of Irish origin are hardy to zone 7 with protection, while the taller, more vigorous plants of Spanish origin vary from zone 8 to zone 7. All require damp, lime-free soil, and provide neat ground-cover but are suspect in dry conditions. Erica mackayana produces new shoots from the roots which can be detached to form new plants. Closely related to cross-leaved heath (Erica tetralix) and also to the Andévalo heath (Erica andevalensis). Bushy shrub to about 1m tall; mature stems stout and woody with grey bark; leaves in whorls of 3, to 5(–10)mm long, linear; flowers in terminal umbels of 3–6 flowers; calyx with 4 free sepals, centre green, sometimes tinged pink; corolla mauve (H2) to 5mm long, tubular-ovoid; stamens 8, included; anthers with spurs; fruit with woody, thickened walls, very hygroscopic, opening wide on warm dry days; interior of valves glossy, pale gold when freshly opened. Restricted to the mountains of Madeira, and one thought to be only a subspecies of the bell heather. However it may be more closely related to the Corsican heath (Erica terminalis). Very uncommon in cultivation and not available commercially. 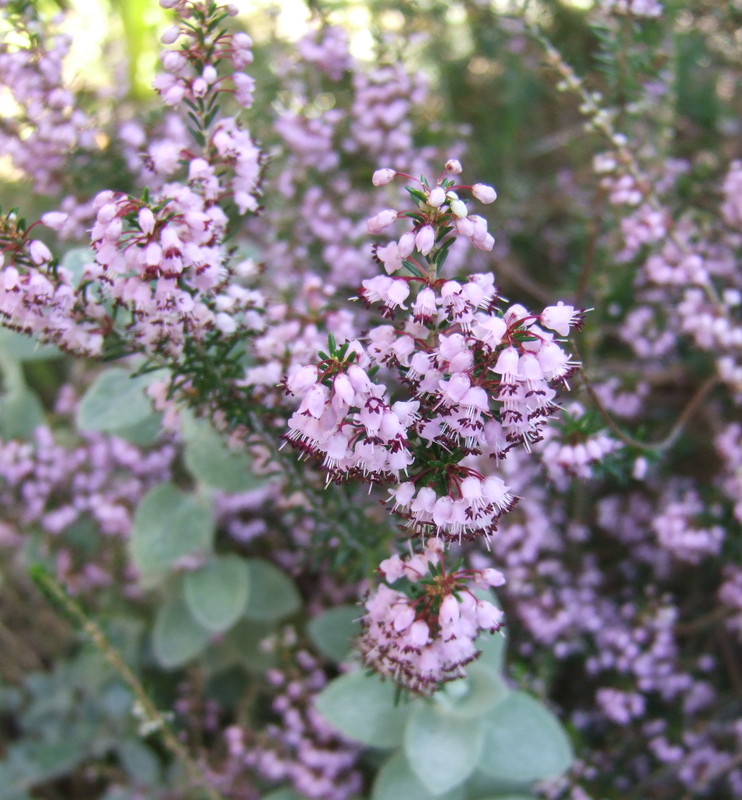 It can be grown successfully in lime-free and well-drained sompost in containers with protection from winter frost (see Yearbook of The Heather Society 1999: 11–21. Heathers 5: 17–25. 2008). Closely related to Cornish heath (Erica vagans). Only pink-flowered cultivars are commercially available at present but white-flowered plants are known in cultivation (one clone has been named 'Olivia Hall' but it is not commercially available). Bushy shrub to 0.3m tall, with pubescent shoots. Leaves dark green, scattered, to 6.5mm long. Flowers small, in elongated terminal clusters of 20-30; calyx cup-shaped, 4-lobed, dull pink; corolla to 5mm long, campanulate to ovoid, bright mauve to lilac-pink; stamens 8(–10), included, variously malformed; anthers without awns; pollen observed; style usually straight, protruding. Hardy and tolerant of lime. Blooms mainly in summer, but clones vary in their flowering period so there are flowers evident from spring to early winter (April to November). The flower spikes can be killed by severe frost. 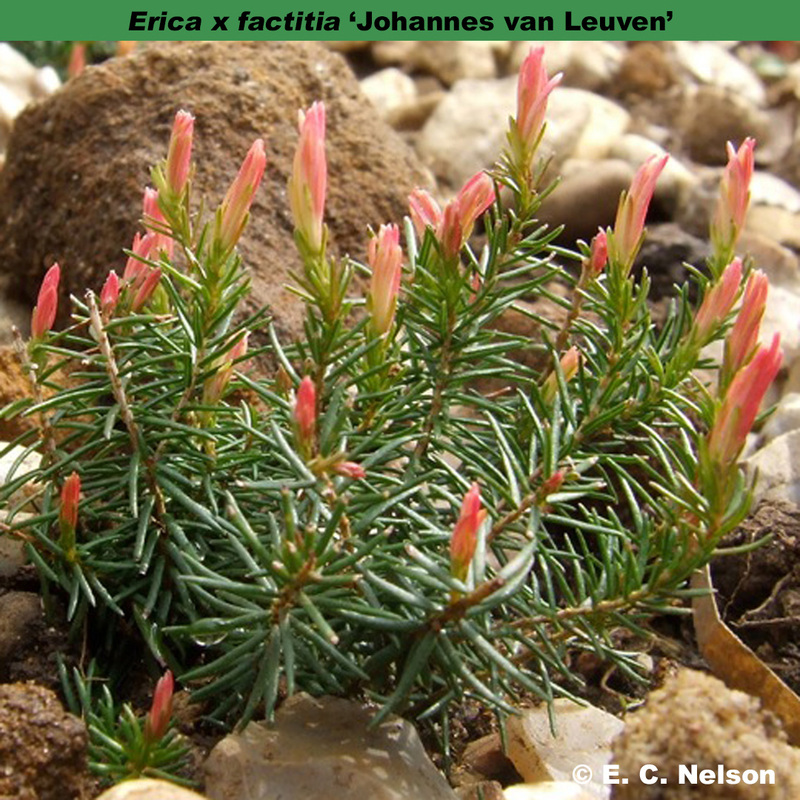 An artificial hybrid, created by Kurt Kramer (Edewecht, Germany), from the Eurasian species Erica manipuliflora (whorled heath) and Erica spiculifolia (Balkan heath). Similar to Erica x gaudificans but with darker pink flowers and minute hairs on the apex of the ovary. See the Bruckenthalia Hybrids article for further details. Two cultivars have been named, and both are propagated in large quantities and sold as pot-plants, especially by German nurseries. However, plants can be cultivated outdoors. Erect shrub to 2.5m; leaves spreading, usually in whorls of 4 or 5, to 15mm long; flowers in axillary clusters of 1–4, towards the tips of the shoots; calyx 4-lobed, fleshy, waxy, white or pink; corolla ovoid, white to pink, 4–6mm long; stamens 8, emergent; anthers without spurs; nectar profuse. Blooms mainly in autumn and winter but can occasionally be in flower throughout the year. A western Mediterranean species ranging from eastern Spain to the Balearic Islands, southern France (including northern tip of Corsica), Italy (including Lampedusa, Sardinia and Sicily), Malta and Gozo, as well as coastal regions of Croatia, Albania and north-west Greece. It is also found in Morocco. 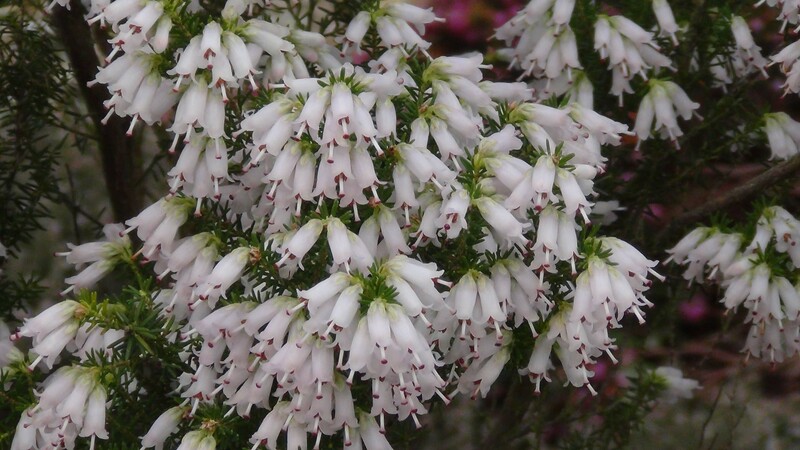 Somewhat similar to the Cornish heath (Erica vagans) with flowers of a similar colour range but unlike the Cornish heath all the flowers tend to open together and can provide a spectacular display. It is lime-tolerant but is not really hardy which may account for its rarity in cultivation. Suitable for hardiness zone 9. Shrub to 1m tall; leaves in whorls of 3, linear, to 1cm long; flowers on axillary shoots in terminal whorls of 3–5; calyx with 4 unequal lobes, waxy, thicker in texture than corolla, usually white with green or yellow-green tips; corolla ovoid, pink, to 5mm long; stamens 8, often malformed; anthers without spurs. Blooms in winter to late spring. Two clones have been named. These besom heaths are found only on the widely separated archipelagoes in the eastern Atlantic Ocean: the Canary Islands and Madeira. The populations are regarded as representing two subspecies; that in the Canary Islands is named Erica platycodon subsp. platycodon while the one restricted to Madeira and the adjacent island of Porto Santo is Erica platycodon subsp. maderincola. Shrub or tree to 6m or more tall; leaves about 9mm long, patent, with pair of furrows underneath; calyx green, cup-shaped, with 4 equal lobes; corolla greenish white to deep red with paler lobes, bell-shaped, to 3mm long; stamens 8, included; anthers without spurs; style-end disc-shaped, concave, about 1.5mm diameter, deep red (the same colour as the immature anthers); nectar not produced. This is the least hardy of the subspecies, only suitable for zones 6–9. Shrub or small tree to 4m; leaves 10–12mm long, spreading, in whorls of 3 or 4, furrowed underneath; calyx green, conical, 4-lobed; corolla greenish pink, ovoid, 2–3mm long; stamens 8, included; anthers without spurs; style-end disc- to saucer-shaped; nectar not produced. Blooms in late spring and early summer. The Madeiran besom heath tends to have a more laxer habit than the Canarian one, longer leaves more widely spaced and spreading when mature, a shorter calyx and corolla with the stigma more exserted. Suitable only for zones 6-9. Both subspecies require lime-free soil. Shrub to 4m tall, older plants tree-like; leaves linear, about 7mm, in whorls of 3 or 4, spreading or ascending; inflorescences numerous, crowded on shoots and appearing to form a raceme; individual inflorescence 1–3 flowered umbel; calyx green, 4 lobed; corolla to 2.5mm long, campanulate, greenish or tinged with red; stamens 8, included or rarely partly exserted; anthers without spurs; style-end disc-shaped, to 1mm in diameter, usually dark red ; nectar not produced. Blooms from mid-winter to early summer. 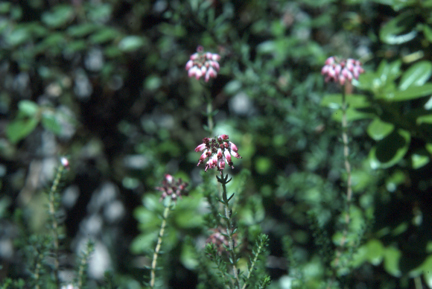 Besom heath is widespread on the European mainland and in north Africa: France including Corsica; north-western Italy and Sardinia; Spain including Balearic Islands; Portugal; Morocco. It makes a rather untidy bush and varies in hardiness, being generally suitable for zone 7, although some of the dwarf cultivars are suitable for zone 6. There are two subspecies recognized. Dwarf shrub to 0.25m tall; leaves in whorls of 3 or 4, spreading or ascending, linear, to 6mm long, pubescent on upper surface; flowers 2–3 per umbel, terminal on main or axillary shoots; pedicels 8–15mm long, pubescent with short, very sticky, gland-tipped hairs; calyx pale pink to dark red, with 5 unequal sepals, free except at base; corolla pale to deep pink, urn-shaped, to 8mm long, 5-lobed; stamens 10, included; anthers without spurs; ovary 5-locular, very densely hirsute; style-end not exserted, capitate, about 0.6mm diameter. Bloom in late spring and summer. 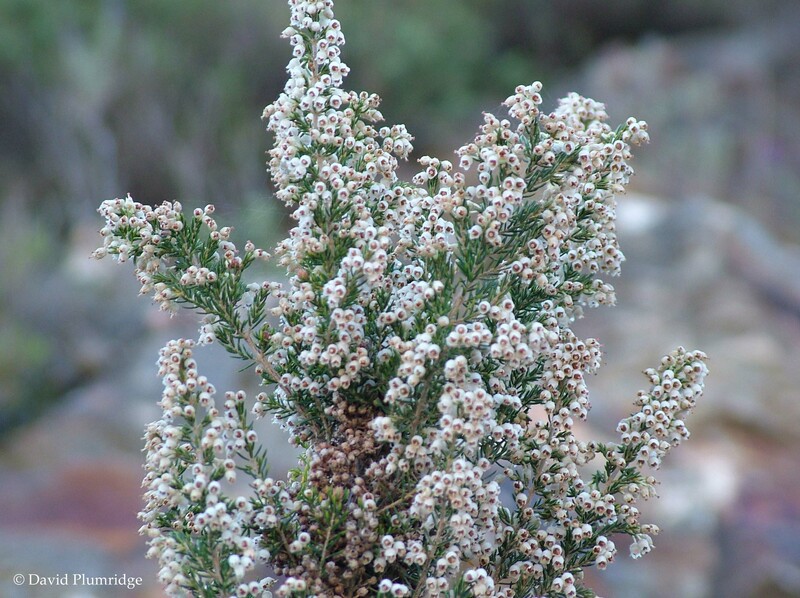 Bocquet's heath is found in Anatolia, only at high altitudes. It is in cultivation. Low shrub to 0.6m tall, often forming hummocks; shoots erect; leaves in whorls of 4 or 5, spreading or ascending, linear, to 13mm, often velvety; 2–8 flowers, rarely more, in terminal umbel son main or axillary shoots; calyx pale pink, with 4 or 5 free sepals; corolla pale to deep pink, sometimes white, urn-shaped, large, to 8.5mm long, 4-5-lobed; stamens 8 or 10, included; anthers usually without spurs but sometimes with minute vestigal spurs; ovary 4- or 5-locular, pubescent; style-end capitate, about 0.7mm diameter, dark red–black, usually at mouth of corolla but sometimes emergent; nectar profuse. 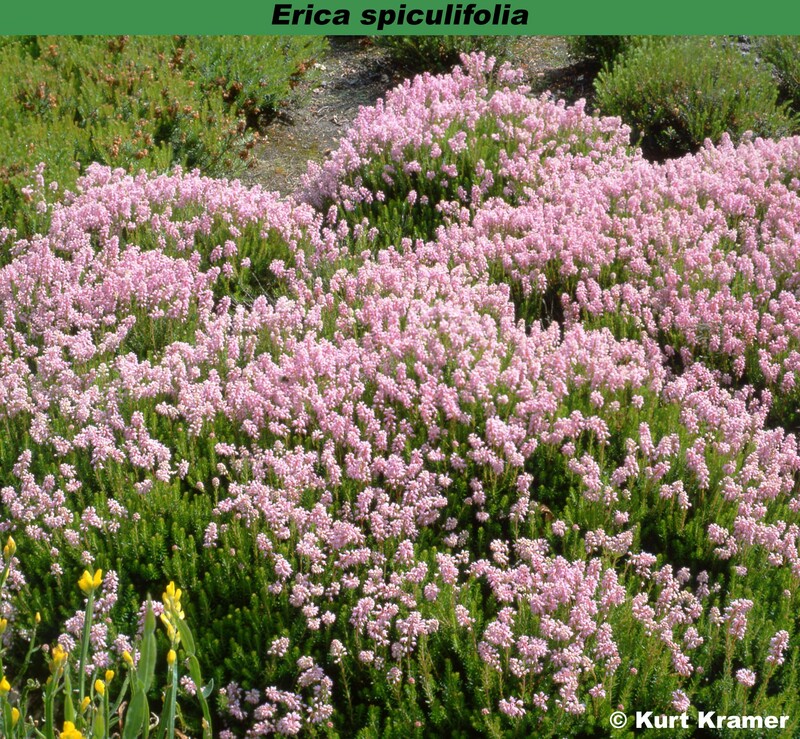 The Sicilian heath occurs in widely scattered localities in the eastern Mediterranean, often in remote and isolated habitats: Sicily – confined to Monte Cofano and Isola di Marettimo: Libya – Cyrenaica only: northern Cyprus: Turkey – Anatolia; Lebanon. In cultivation in botanical collections. Low shrub usually less than 0.5m tall; young shoots often brightly coloured; leaves in whorls of 4, more or less evenly spaced but internodes increasing in length towards inflorescence; flowers in uneven, terminal umbel; calyx with 4 separate, often unequal sepals, to 3mm long; corolla urn-shaped, usually pink; stamens 8, included; anthers with spurs; nectar produced, conspicuous. 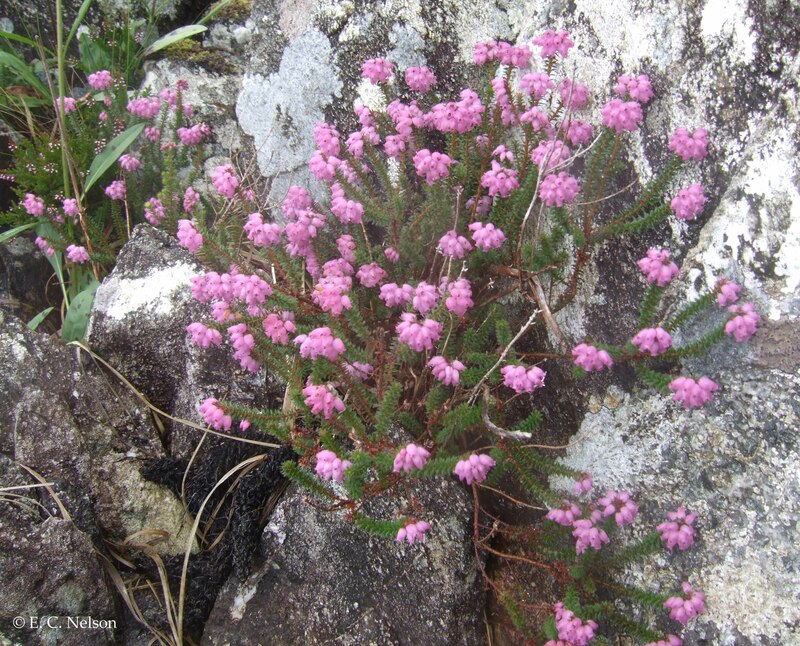 Praeger's heath is a naturally occurring hybrid between Mackay's heath (Erica mackayana) and cross-leaved heath (Erica tetralix) which has been known for a long time from Connemara and Donegal but also occurs in Kerry and has recently been reported from northern Spain. The cross has also been made artificially and several man-made clones have been named. 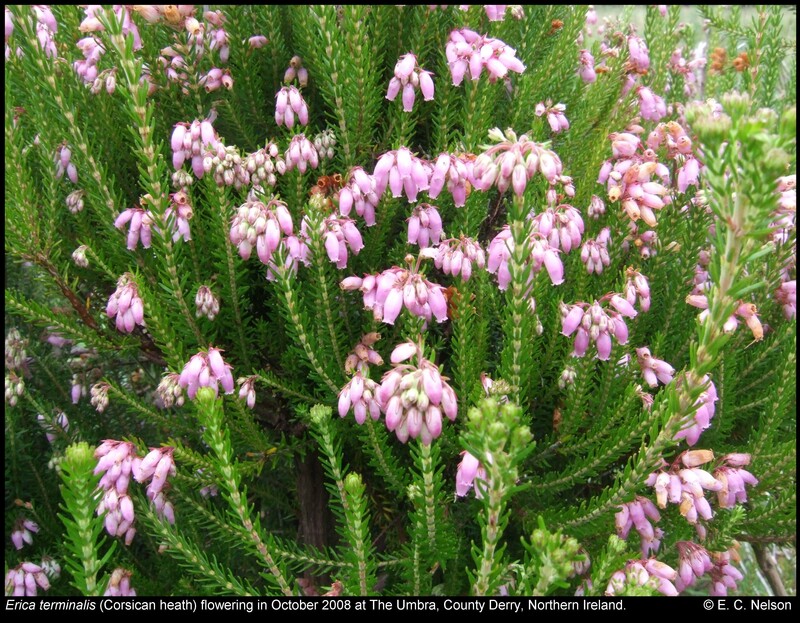 Its habit and cultural requirements are similar to those for the Irish clones of Mackay's heath. All the named cultivars exhibit brightly coloured spring growth and are suitable for hardiness zone 7. Shrub to 2–3m tall; shoots upright; leaves in whorls of 4, to 9mm; flowers in terminal umbels; calyx with 4 free sepals; corolla 6–7mm long, urn-shaped, pink; stamens 8, included; anthers with 2straight spurs; nectar produced; style-end capitate, about 4mm diameter, exserted. Blooms from late spring to late summer, or early autumn. Few cultivars have ever been named, and it is not as common in cultivation as it deserves to be. Low twiggy shrub, stems erect or creeping, to 0.5–1m tall; leaves in whorls of 4, 3–8mm long, spreading in lower part of shoot but becoming erect and parallel to shoot below inflorescence; sometimes very densely hairy and so appearing grey; about 9 flowers in each terminal, usually lopsided umbel; flower stalks densely woolly; calyx with 4 free, green sepals, woolly on outer surface; corolla urn-shaped, usually pink, darker on sunlit side shading to white, or rarely pure white, to 7mm long; stamens 8, included; anthers with white spurs; nectar produced. Blooms in summer to mid-autumn. Native in western Europe from Scandinavia to the Iberian Peninsula. Although usually found in boggy areas in the wild, it is tolerant of drier conditions when brought into the garden. It requires acid, preferably moist, soil, and is suitable for zone 4. Low bushy shrub, to 0.6m tall, shoots upright, slender; leaves in whorls of 3, small, to 4mm long; 3–6 flowers in terminal umbels; calyx of 4, ± separate, unequal, green sepals; corolla to 5mm long, top- or urn-shaped, pink, very rarely white; stamens 8, emergent; anthers without spurs. This heath occurs wild in Spain, Portugal and northern Morocco. It is a very useful species because in gardens it bridges the 'June gap' between the spring-blooming and later summer-blooming heathers. It requires well-drained soil that need not be lime-free. Suitable for zone 8. There are only two named cultivars. Shrub to 1m tall, branches erect or decumbent; leaves in whorls of 4 or 5, linear, to 10mm long; flowers in umbels on condensed lateral shoots, numerous umbels forming a spike; calyx unequally 4-lobed; corolla bell- or cup-shaped, to 5mm long, in various shades of lavender, mauve or pink, very rarely white; stamens 8, emergent; anthers without spurs; nectar produced. 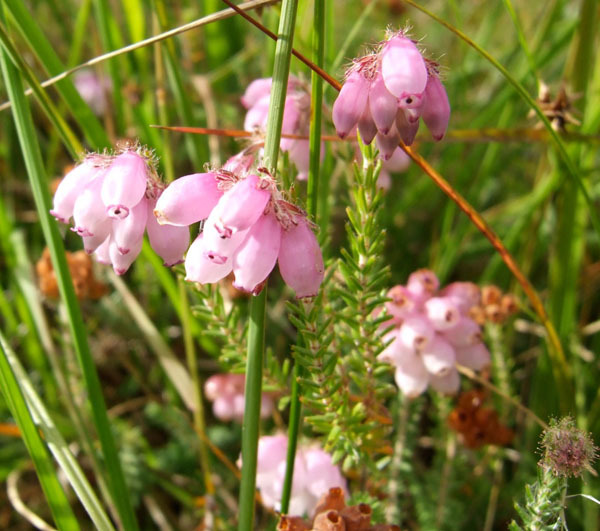 Cornish heath occurs wild in Britain only on the Lizard Peninsula in Cornwall. It also ranges though western France, into the Pyrenees, and northern Spain. There is an enigmatic colony of white-flowered plants in Northern Ireland. It can be successfully grown on any soil rich in magnesium and responds well to hard pruning. It is suitable for zone 5 provided the dead flowers, which are an attractive russet in winter, are kept on the plant. Variable shrub to 4m or more tall; shoots hirsute with both simple and plumose hairs intermixed; leaves linear, to 6mm long; flowers white, in terminal whorls of 3 or 4; calyx 4-lobed, green, cup-shaped, waxy, thicker in texture than corolla; corolla tubular-campanulate, to 4mm long; stamens 8, included or tips just visible at base of corolla lobes; filament with spicules on lower quarter; anthers with spurs. 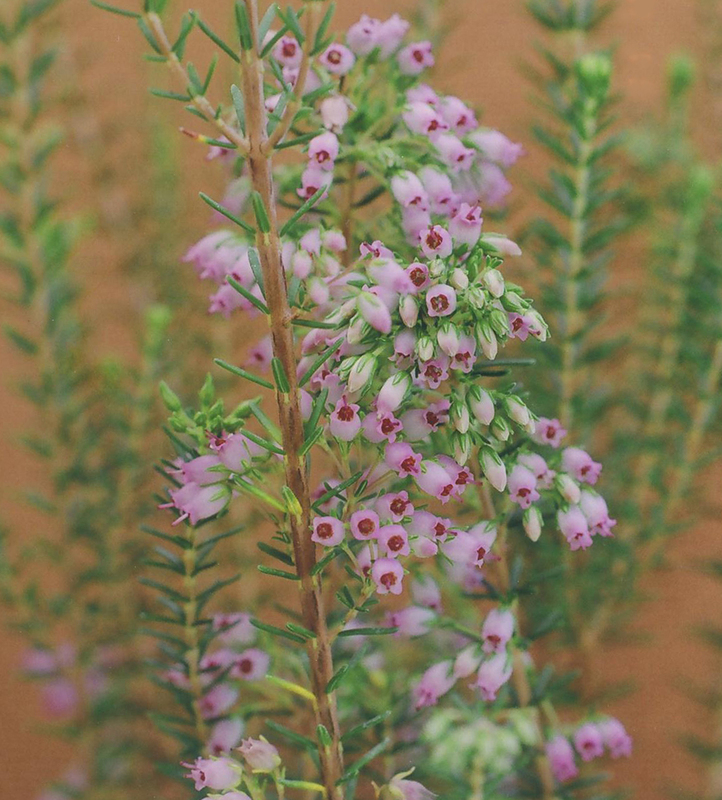 A hybrid between tree heath (Erica arborea) and Portuguese heath (Erica lusitanica), represented in cultivation by at least five cultivars which vary in hardiness from zone 7 to zone 8. 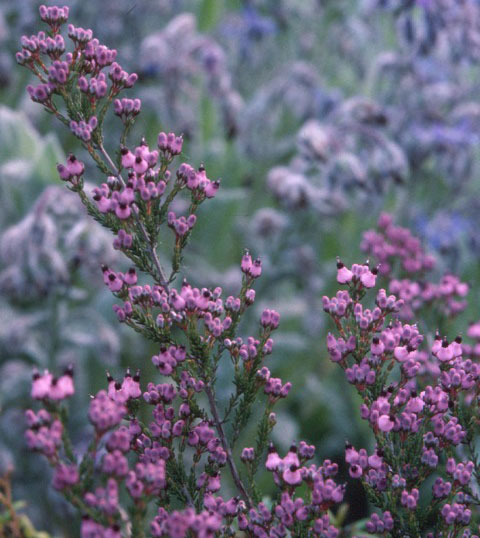 Veitch's heath can be grown in most alkaline soils. All the cultivars are of garden origin, and while there are reports of this hybrid occuring naturally in northern Spain these reports have never been proven beyond doubt. Very variable shrub to 0.5m tall; leaves in whorls of 4, to 3.5mm long; flowers in elongated or umbel-like spikes; calyx green, sepals unequal, separate; corolla pink, or white and pink, usually lop-sided, about 9mm long; stamens 8, included; anthers with vestigial spurs. 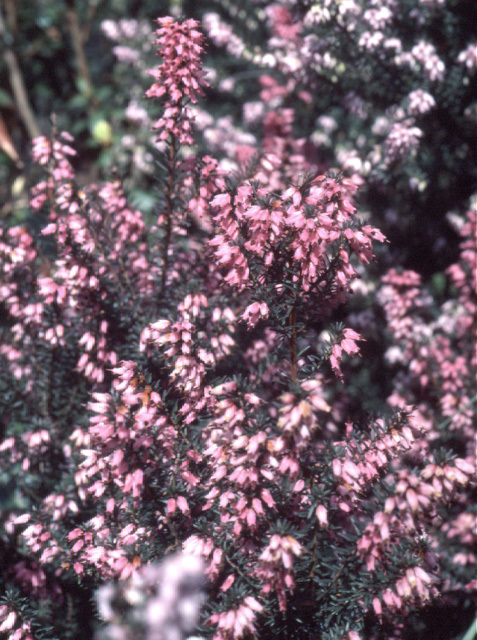 Watson's heath, named after the English botanist Hewitt Cottrell Watson, is a hybrid between cross-leaved heath (Erica tetralix) and Dorset heath (Erica ciliaris). It occurs in the wild in Britain, France and Spain, andoccurs in the wild as a natural hybrid in Britain, France and Spain, and it has also been created artificially. The habit of the clones in cultivation varies considerably but generally they have a long flowering period and brightly coloured tips to shoots in spring. They require acid soil conditions and are suitable for zone 7. Around a dozen cultivars are named. Variable shrub; shoots with bright yellow tips in spring; leaves in whorls of 4, to 5mm long; flowers usually in terminal umbels; ; calyx 3- or 4-lobed; corolla pink, to 5mm long, urn-shaped; stamens 8, usually included, but stamen length is very variable; anthers very small, spurs absent or present. Suitable for hardiness zone 5. About a dozen cultivars are named.